We're quietly sitting in the office, and hear a BOOM, which is not that big a deal in the sunny Mission. Then another, and then another, and then another, in rapid succession, followed by sirens and helicopters and then more BOOM BOOM BOOM, and finally we turn down the techno and Mike says to me "um... do you think we should go take a look?" 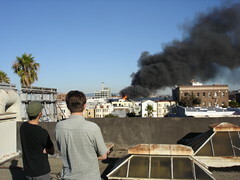 We head to the roof and it's not quite the giant robot stomping on buildings that we had imagined, but pretty close - smoke belching from a building on South Van Ness & 16th (about two blocks away) & periodic BOOM BOOM BOOM accompanied by huge balls of flame.